We were told as we were handed the menu that it was still a work in progress and not yet final. We were also informed that since this was their soft opening period, we would only be charged half price for tonight's dinner. BRAVO! This is EXACTLY what most restaurants should be doing, and has been the subject of numerous debates and discussions among the journo/blogger community - my most recent discussion on this topic was with the big boss Harlan G.
Griddled scallops with chestnut purée, shiso and lemon - this was the starter that both of us wanted, and for good reason. The mi-cuit scallops showed perfect execution from the kitchen. The rich flavors of the butter and chestnut purée were balanced by the tartness of lemon, while both the lemon zest chiffonade and perilla leaves added their distinctive fragrances to the mix. Very, very nice. Baked quince with frangipane - fall is here and that means quince season. The spiced flavors here were nice, and exactly what I wanted out of this dessert. Rice pudding with apricots - I only had a spoonful, but this was not bad at all. The top layer was slightly charred to give it more oomph, and the apricots were a nice touch. 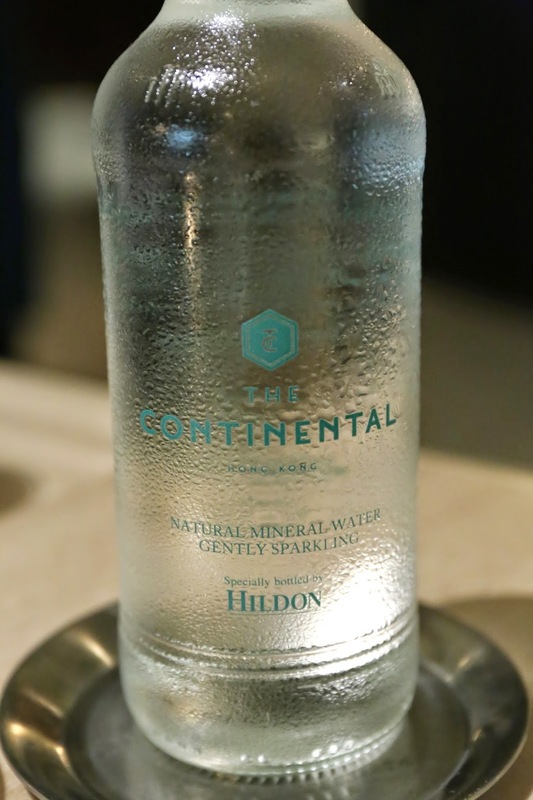 Finally, in the category of "spared no expense", how about getting Hildon to come up with a special bottling just for you? I think we mostly picked pretty classic dishes tonight, and in reality I would have liked to have the opportunity to taste the more interesting and creative options. Having said that, all the dishes came out as pretty solid and were certainly enjoyable. And the slight mishap of the overcooked beef is easily forgiven considering the 50% discount on food (full service charge was still levied). Next time I'll be going for more of the French and Italian offerings on the menu.